Jayson Werth was a huge contributor offensively and defensively this year when allowed to play. For a large part of the season he was platooning with Geoff Jenkins, who can only really be successful when the matchups are perfect. Over the last few years, and for the majority of this year, experts would often point out how Werth bails on inside pitches from righties. This can be attributed to the broken wrist he received after being hit by a pitch a few years ago. However, this past season witnessed Werth's progression into a solid everyday player with good power, and a good eye for walks. Werth's OBP splits don't differ by much (.360 RHP/ .368 LHP) while his slugging against lefties is much better (.407 RHP/ .652 LHP). While he is not completely there yet, he is most certainly a viable everyday player when talking about platooning with the likes of Geoff Jenkins. While his offense was certainly a huge boost for the team this year, his speed also played a large part in the Phillies success. Werth stole 20 bases in 21 attempts this year (known for stealing 2nd and 3rd back to back), and has very good range in the outfield. The outfield combination of Werth and Victorino makes it very difficult for opposing teams to take the extra base against the Phils. Next year, it should be interesting to see what role Werth fills when it comes to the lineup. He gets on base better than the majority of the Phillies starters, has good power, and can steal bases. Werth still has a few more years of development ahead of him, and should be expected to ripen with age (for now anyway). 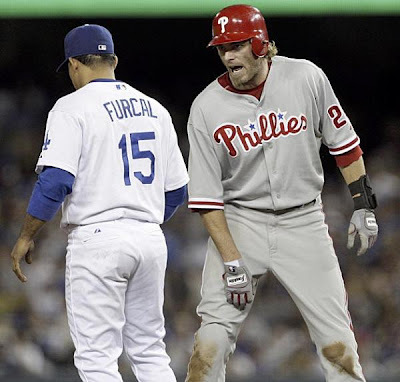 "Thanks for the ring, Knoblauch"